What Garage Door Type is Suitable For Me? Firstly, why are you changing your door? Appearance? Modernising? Have you purchased a new vehicle that won’t fit through the existing opening? Whatever the reasons may be, there are a number of boxes that need to be ticked before making a final decision. Will My New Garage Door Give Me Adequate Drive Through Space? 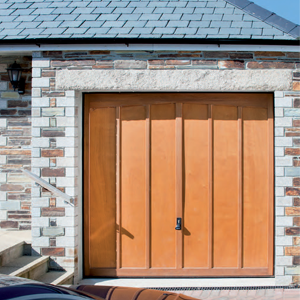 Do ensure that your new garage door provides enough width, height and depth for your vehicle and other uses. Just because your existing garage door does, it is best that you don't automatically assume a new one will. 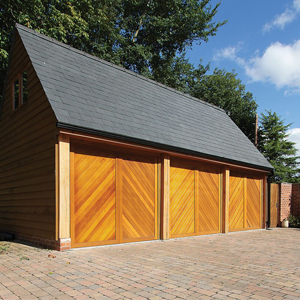 Even if the new garage door is the same ordering size, if you are having a steel fixing frame, it may be wider than a previous timber frame fitted, which will immediately decrease your drive-through width. Important: If a new frame is being fitted, remember to ask if it will affect the available height and width. Secondly, if the position of your new garage door differs from the present position, you will very likely lose either height, width or depth of the garage. For example, if your current door fits between your opening and your new door is to be fitted behind the opening, you will gain drive-through width and height but lose some of the depth of your garage. Likewise, if your present door sits behind your opening and the new position is at the front of the opening, you will gain garage depth but at the detriment of the drive-through height and width. 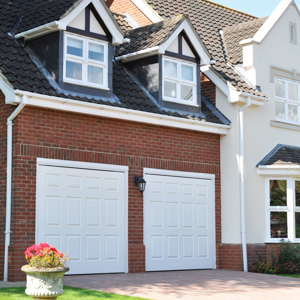 Important: Check where your new garage door will be fitted and what the implications are. If you don’t use your garage to store your vehicle, do still check the above points. Circumstances may change whereby you will start to use the garage for your car, so be sure to consider future use too. Important: If you are planning on a change of vehicle, verify the measurements of your intended choice to ensure it will fit! If you find out that your chosen garage door will not give you adequate drive-through width and height, there are quite a few options that can easily maximise what can be achieved. If you are looking at a retractable garage door and the drive-through width looks tight, there are is a very simple solution – gear positioning. 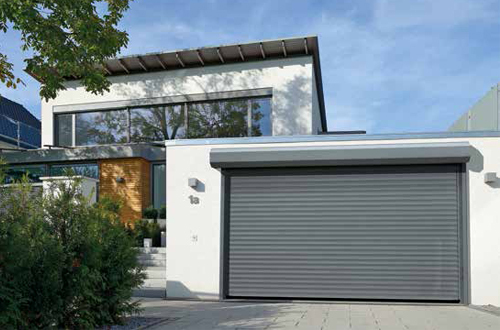 Important: On certain models of garage doors, the gear is fitted higher, thus avoiding car wing mirrors - Hormann and Garador – (Plus Gear) and Novoferm (retractable doors) all have this gear arrangement. Whilst on the hunt for a garage door, you may well find various claims regarding the levels of insulation that you can expect. If you actually have a totally plumb garage which has completely level floors and straight walls, it is possible to achieve a fully insulated garage with a perfectly fitted sectional garage door. Different companies offer different levels of insulation properties with their garage doors. Remember – if your garage is out of square, if you do not have a level floor you cannot expect to achieve a total seal. Important: Make sure that they undertake a thorough survey and – frankly – if you know that your garage is not plumb - don’t expect miracles! Should You Replace Your Fixing Frame? Should The Replacement Be Steel or Timber? If there is any sign of rot on an existing timber frame, this should certainly be replaced, otherwise your new door will outlast your frame. The choice of whether the frame should be steel or timber depends on your circumstances. If your new door is steel then a matching steel frame would be advised. If you are having a timber door – you may prefer a timber frame. Hormann timber doors all come with a powder coated steel frame. 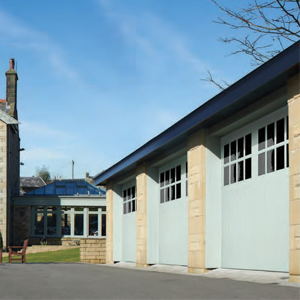 You might be offered GRP frames with GRP garage doors. Note: a GRP frame cannot be trimmed to suit. Important: Make sure that you know what you are getting, and that the installing company are taking liability to ensure a perfect fit and that you are happy with what you have ordered! Are You Intending On Having Remote Controlled Operation? Any reputable company will be able to advise you on which operator is appropriate to lift your chosen door. However, different operators come with varying handsets and available accessories. For example, Hormann remote controlled operators come with a very wide range of handsets – different styles, shapes, sizes, buttons etc. Also consider whether you want other means of access – perhaps digi-pads where you tap a code in to active the opening and closing. Digi pads are very convenient if quite a few people access the garage(s), or if handsets seem to get lost a little too often! The downside of digital code pads is that you do need to leave your vehicle to enter the security code. Remember – if your garage door is electrically operated and there is power failure, you will need to put the operator into manual mode – do you have other access to the garage than just the garage door? If you don’t then you will need an emergency release fitted. If you are not having electric operation initially, but feel you may want it added at a later date, do make sure that the door you are buying is compatible for retro fitting of an electric garage door opener. Important: Check what hand transmitters come as standard with your chosen operator. Decide which accessories you would like either now or in the future and make sure that they will be available. If you wish to operate other items (such as electric gates), check compatibility and that there are enough buttons on the handsets. Do a test run on the emergency release whilst the installers are present to ensure that it works efficiently. Finally – only qualified electricians (Part P certified) are allowed to alter or install circuits within garages. When a garage door is replaced what, finishing should you expect? The consequences of removing a garage door can vary enormously. If the frame is staying in, it is unlikely that any damage will be incurred to the garage. However, if the frame is being removed, it is quite often virtually impossible to gauge just what damage may be incurred. For example, on some older garages, the garage door frame might be tied into the structure of the garage. A (brickwork) soldier course might be supported by the head frame. A soffit might be supported or attached to the garage doorframe. Taking out a frame will definitely leave an appearance of ‘scabby’ brickwork and could even ‘blow bricks’. Occasionally the head of the frame is actually tied into the brickwork which could represent quite major work. Upvc flat-board is normally used to cover minor gaps and rough brickwork. Important: If you are having a company install your door(s) you should expect them to undertake a survey. Do establish what the installation does and does not include. Don’t be unrealistic – what is not visible cannot be allowed for – especially if you are pressing for the lowest possible price. Think - What Is Actually Included In The Sale? As you can see from the various images on this page, not only are there different types of doors to choose from, but there are also many patterns and designs. Modern technologies allow companies to manufacture the most personalised of doors, meaning doors can be to your exact taste and style of your home. Pictures of garage doors in brochures and websites nearly always show standard size (7066/7070) doors. If you order a purpose made door or a smaller or larger door, the pattern will probably differ – the styles at the top, bottom and sides may be wider or narrower. Important: Feel free to ask to see what the door will look like before ordering. 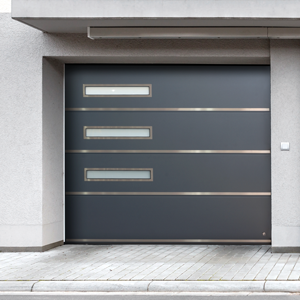 You wouldn't order a new car without seeing it, so why take the risk with a garage door? If you really do want virtually maintenance-free doors, then you cannot do better than buying a good quality GRP garage door with a powder-coated steel subframe. Warranties and guarantees are full of ambiguities. For example, a garage door may have different lengths of guarantees for different elements; likewise operators – the motor may carry a longer warranty than the receiver. Remember most warranties are subject to the door/operator being properly maintained. If your door has a blemish when it is first supplied/fitted, do be aware that it is not necessarily rejectable. The industry standard is that ‘if a mark cannot be seen from 3 metres away in natural light with the naked eye then it is of an acceptable standard’. Important: Clarify exactly what is covered for how long before you order. And remember to keep your receipt – you may be asked to produce proof of sale if you are making a claim some years after your garage door has been fitted. Do your research. If you are a useful ‘do-it-yourselfer’ you may wish to undertake the installation yourself. All doors and operators come with fairly explicit instructions. Otherwise you would be advised to have it professionally fitted. If you do decide to fit it yourself you probably will not have a survey undertaken on your garage by a specialist. Make sure that your chosen door will fit your garage – and do make sure that you have adequate headroom, especially if you are buying a roller shutter. Important: When arranging an installation/delivery date, do be aware that the distributor is in the hands of the manufacturers and this date could be subject to change. Obviously we would like everyone to buy from us! However people like to keep their options open so here is a list of points to take into account. If you are buying via the internet – exercise caution. Some companies selling garage doors via internet sites have started up without any real product knowledge or experience. There is a legal obligation for internet companies to comply with certain regulations. Addresses, telephone numbers and company registration should all be shown on the site. Generally it is preferable to buy from a company that was an established garage door specialist before launching a web site. Check how long the company has been in existence and don't forget some people lie unfortunately. Find out whether they have a showroom/sales office. If there is no address clearly staed on the website then you should be suspicous of the actual company you are dealing with as it may well not be the name of the website and they may be simply capturing your details as an opportunity to pass on. If you are buying from a company (not from the internet) do visit their showroom if you can. Make sure that any surveyor has proper access to your garage – the more he can see, the less likely there will be of any shocks when the door is being installed. If you are impressed with a neighbour’s garage door then do ask who they bought it from – recommendations count for a lot. - If you are south facing avoid dark coloured garage doors – they expand and contract in direct sunlight making them susceptible to panel swelling and consequential ill fitting. - If you live in coastal areas avoid timber doors – salt attacks the wood. - If your garage door opens straight out to a public footpath, do not fit electrically operated up and over doors – you cannot see who is walking past when you open them from the inside. - If you are buying doors with tracks (retractable or sectional garage doors) do your homework to ensure that the tracks will not foul the opening of any pedestrian door going into the garage. - Be wary of very cheap garage doors, many of them are not CE compliant, and worse still, possibly very dangerous if not providing basic safety features. 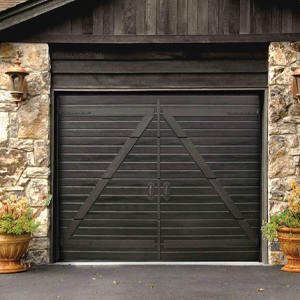 Always check with electric garage doors that they have basic safety features included. If it is a lot cheaper than other quotes there will usually be a catch somewhere. This is especially true for roller shutter doors where cheap really does mean trouble and most days we find ourselves speaking to someone with a roller garage door not fit for its purpose purchased from a company because it was such a good deal but now it has a problem. In many cases nothing ca be done, which can be very dissapointing.